Some readers may remember meeting the handsome Lord D’Arcy in reviews of the novels Sinner’s Opera and Cardinal Desires. This time around, the man described by one character as having a face belonging in the Sistine Chapel and his soul in Hell, recounts several episodes in his Undead existence. The “Devil’s Waltz” concerns an anthrax virus containing a mutagen causing vampires to become mortal and die. Morgan has wearied of immortality, longing for that brief but mortal coil . . .
With that in mind, he becomes part of the experiment. “Sunrise, Sunset” involves an island seductress who uses Morgan’s wish for a single day in the sunshine to blackmail him into committing murder. In “Night Moves,” even pity and sympathy for the victim can’t supersede a vampire’s bloodlust. “‘Who gave you the right to say whether I live or die?’” Her accusation struck me like a blow. “Intermezzo” is an intriguing near-spy drama as a government official plans to sell the formula for synthetic blood to an unfriendly country. With fellow vampire, Lucian St. Albans, Morgan tries to stop the sale. As always, the character of Morgan himself is a deeply conflicted one. In human form, he’s charming and witty; in vampyre mode, he’s blunt and ruthless but at the same time ambiguously hesitant to kill those to whom he’s grown fond. His blatant sexuality is always at the fore though he readily admits he doesn’t love anyone. At the same time, he’s secretly looking for that specific someone . . . to love him in spite of what he is . . . the one woman to whom he’ll give the gift of immortality so she may travel the centuries with him. Through his story runs that single thread . . . Morgan may find a woman but he always loses her, because she isn’t the right one. Author Nightingale’s writing has a lyrical quality, darkly poetic in some aspects but always descriptive and entertaining. She has a way with words bordering on the style of Oscar Wilde, teetering on the epigram, bon mots with a deeply sensual attitude. 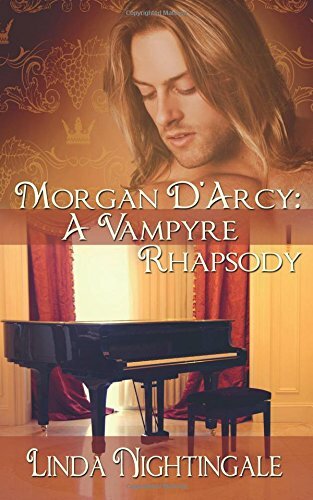 Though her other novels were delights to read, Morgan D’Arcy: A Vampyre Rhapsody is the best to date, a tour de force of luscious description and elegant passages. Her own particular take on the vampire genre is an original idea embellished by descriptive prose. Lovers of paranormal romance will enjoy this book as much for the subject matter as for the lush imagery the writing evokes.